It's been a long and difficult road for The Crow remake. It was announced last week that director Corin Hardy and star Jason Momoa had left the project like the string of actors and directors who have also quit over the years. Production was set to begin in Belgium in the coming weeks, but it is officially grounded again. It is rumored that creative and financial differences with Samuel Hadida were the reasoning behind the split. These creative and financial differences were also a problem for Sony, who was set to distribute the film worldwide. Sources close to The Crow remake imply that Sony hadn't ever even closed the deal because of the problems with Hadida. Now, Corin Hardy has taken to social media to share a picture of himself and Jason Momoa in the Draven makeup, teasing what could have been. 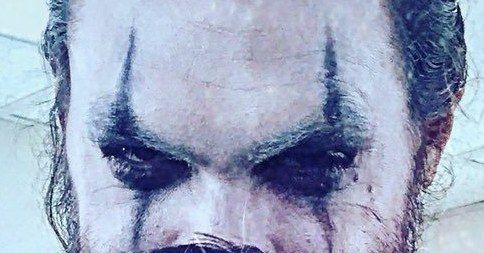 The new picture that Corin Hardy shared on Twitter doesn't show off Jason Momoa's entire face, but it's a pretty good look, even with the actor's beard underneath the black and white makeup. Hardy captioned the photo with a broken heart emoji, letting fans know that he's pretty distraught over the whole situation. Momoa is equally as upset and took to social media to share an apology to all of the fans that have been patiently waiting for The Crow reboot. In his apology letter, Jason Momoa does not go into specifics as to why The Crow reboot is no longer happening, but he does vow to get the movie made eventually, even if it has to take another 8 years to get off of the ground. Momoa has been trying to get the project made for the last 8 years and said, "I can't play anything but what this film deserves and it needs love. I'm ready when it's right." Hopefully when "it's right" doesn't take another 8 years. To make matters worse, The Crow reboot was reportedly set to be a faithful adaptation of James O'Barr's original graphic novel, which had fans pretty excited for. There are however, some fans who would rather see the movie not get made at all out of respect to Brandon Lee who died while filming the original film back in 1994. With Corin Hardy and Jason Momoa on board, it really looked like The Crow reboot was going to be something different from the vibe of the first movie, making it a project that stands on its own. For now, The Crow reboot is dead again. Only time will tell if Jason Momoa will be successful in getting the movie made, but as usual, he seems determined to make it when the time is right. Momoa will be seen on the big screen in December in the DCEU Aquaman movie, which has been getting some pretty good early buzz, which is a point in the right direction after the misfire of Justice League. You can check out the picture of Jason Momoa in The Crow makeup below, thanks to Corin Hardy's Twitter account.